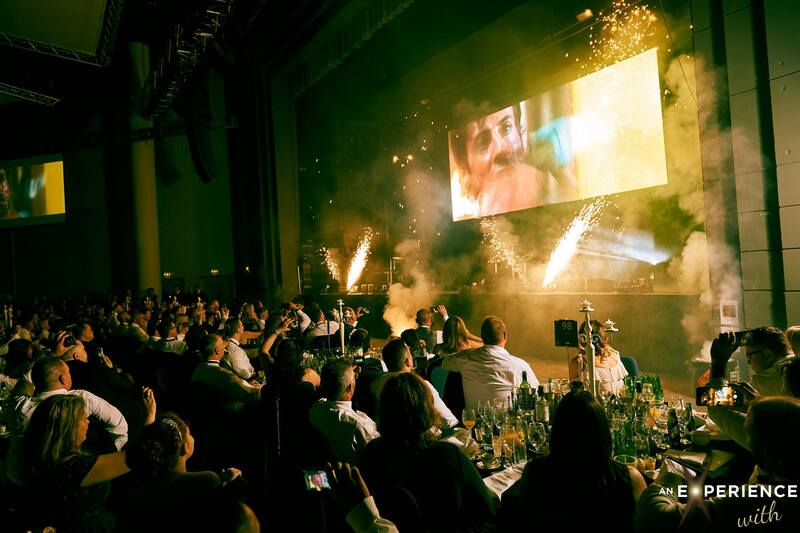 Back in May 2018, An Experience With, a world-leading events company, approached Ignite Pyrotechnics Ltd to discuss incorporating pyrotechnic effects into their forthcoming London and Birmingham events with global superstar and Hollywood icon, Sylvester Stallone. After several email exchanges and phone calls with AEW, it was clear what a massive opportunity this was, and so began many weeks of meticulous planning and preparation. 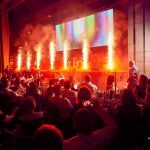 An Experience With are leading producers of high-end events. 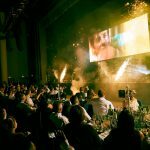 The production values, creative elements, and naturally the hollywood stars at the center of the event – are all of the very highest calibre. 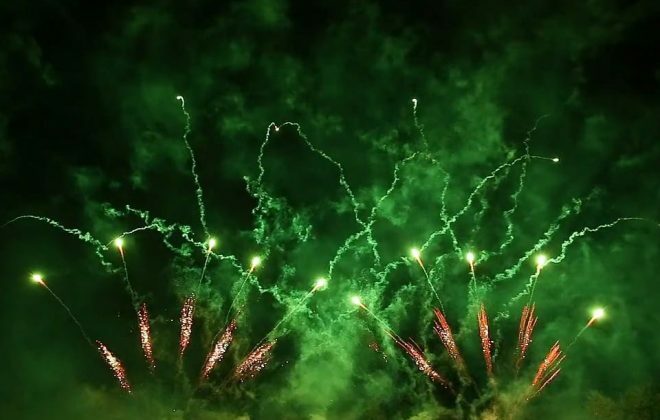 Our brief was clear – to create a high-impact close proximity pyrotechnic display and choreograph it to a specially produced audio-visual opening sequence, accompanied with lighting effects, and live musicians performing only feet away from the pyrotechnic effects. 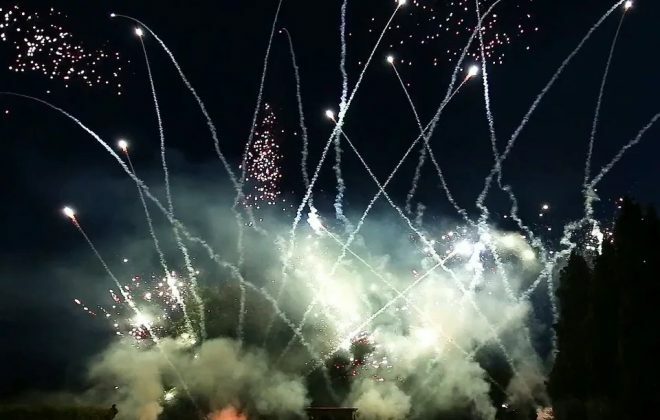 Using explosives in close-proximity to spectators, other performers, and ‘A’ list Hollywood VIPs is not something to be taken lightly, and so we commenced a rigorous series of risk assessments, method statements, test firings, and documentation for each venue. 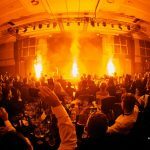 Risk management is a massive part of our job, and it something that Ignite Pyrotechnics Ltd are extremely experienced in. There was only one opportunity to get things right, and absolutely no second chances. Having a ‘bad day at the office’ was simply not an option. 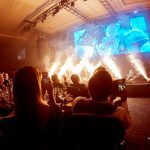 An Experience With had two UK events planned. 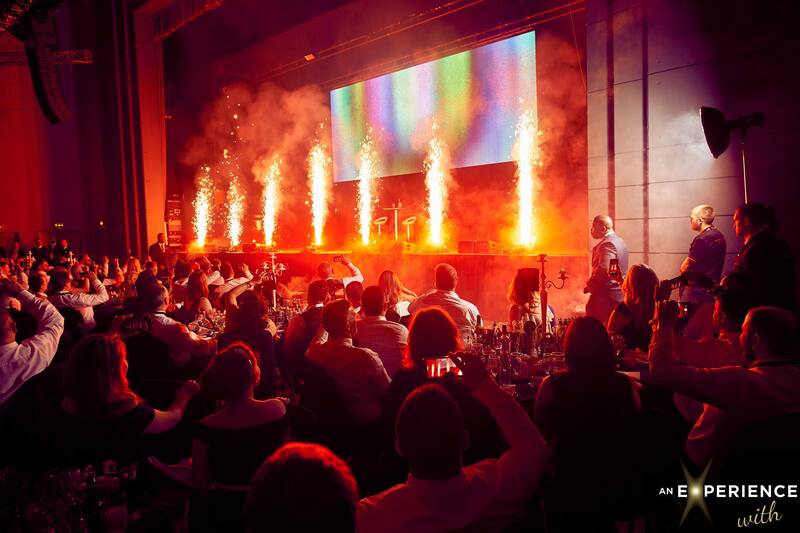 The London date on July 4th was at the InterContinental O2 hotel, located next door to The O2, on the stunning surroundings of the Greenwich Peninsula. 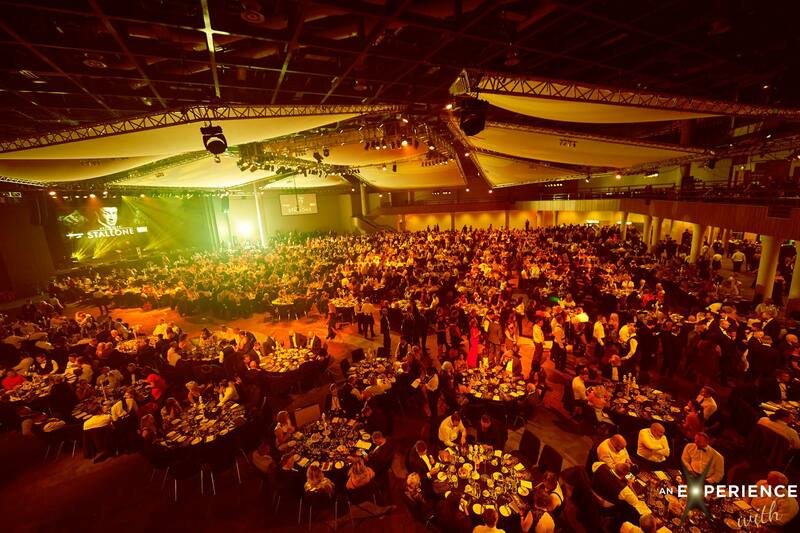 The Birmingham date on July 5th was at The International Convention Centre (ICC), on Broad Street in the city centre. 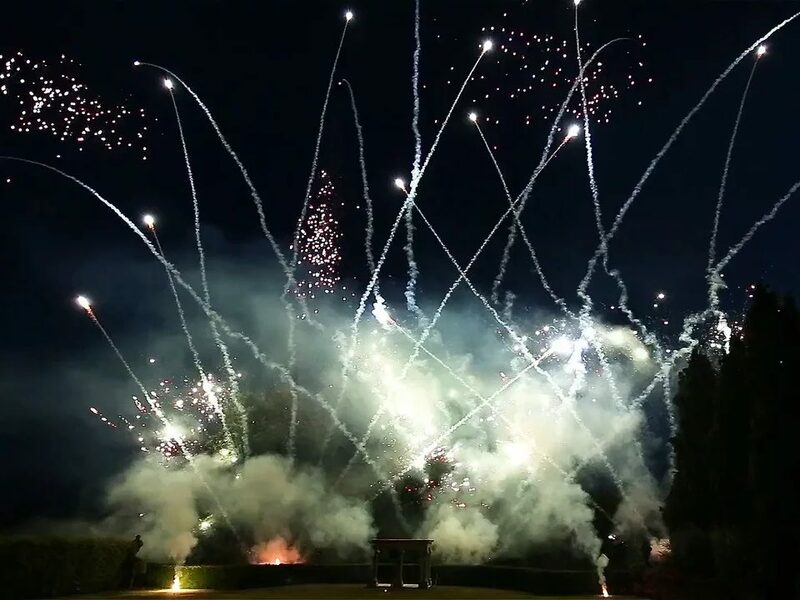 Our display directors quickly arranged site visits at both venues, to assess the suitability of the proposed pyrotechnic effects and look at the various accompanying factors including fire alarm and air ventilation systems, stage access for our crew, and air blast overpressure calculations with the use of theatrical pyrotechnic maroons. 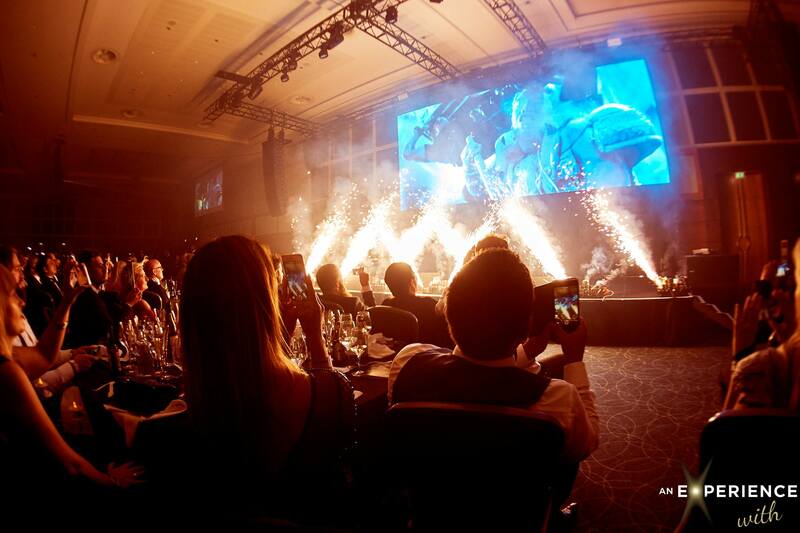 Pyro, Lighting, Video, Sound, a Swing Orchestra and a Pianist! 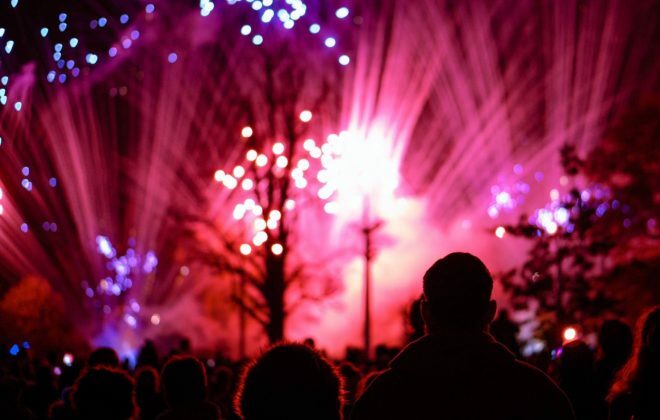 Typically, a fireworks display is accompanied with or without recorded music, and usually the fireworks company control all of the production elements. 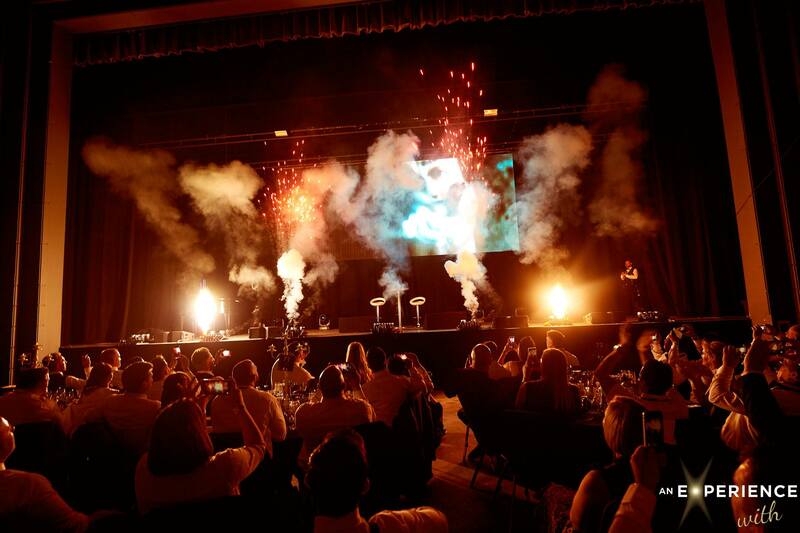 A live event can be far more complicated. 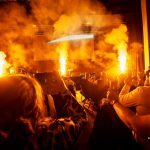 After some technical discussions, it was decided that all of the pyro, lighting effects, video wall and sound would be choreographed using SMPTE linear timecode (LTC). Cue points were agreed with the live musicians – the incredible pianist Noud van Harskamp, and the State 51 swing orchestra. 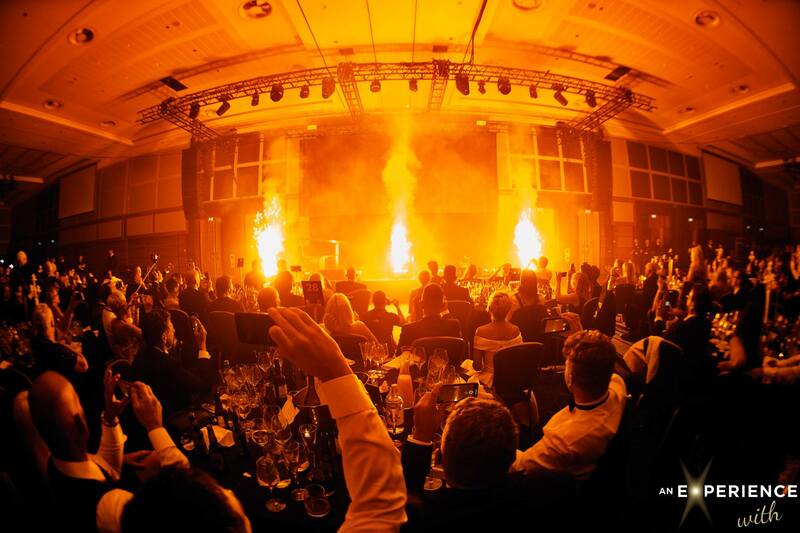 Ignite Pyrotechnics Ltd have heavily invested in FireOne™, the world’s leading digital firing system. We selected FireOne™ because it readily integrates with other production elements, and the system natively supports SMPTE timecode amongst others. 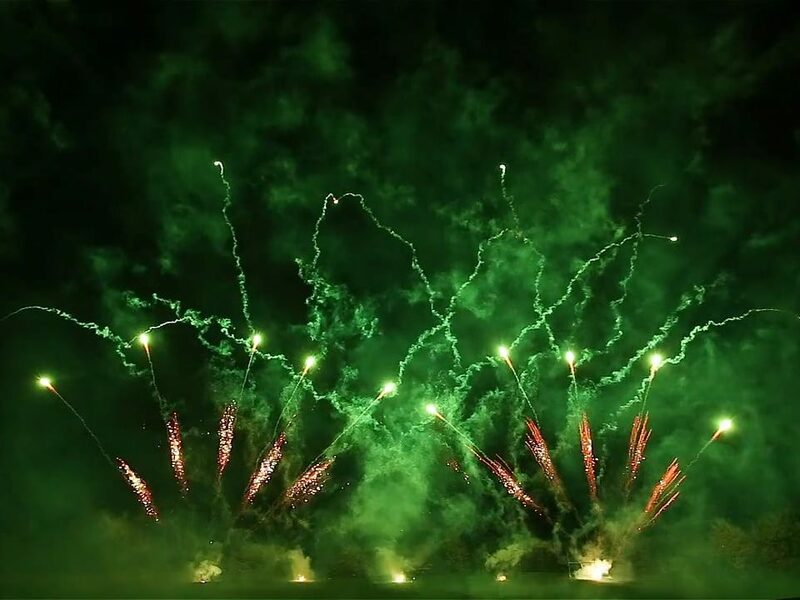 Our team made their way down to London on Thursday with all of our equipment and pyrotechnic effects. 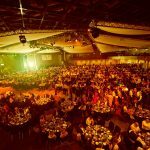 On Friday morning, we arrived early doors at the InterContinental O2 to start loading in the show for the first night. 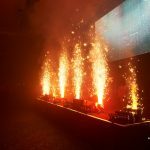 Once everything was in place, a series of full technical rehearsals were conducted, to confirm that all of the production elements were correctly integrated and choreographed as planned. 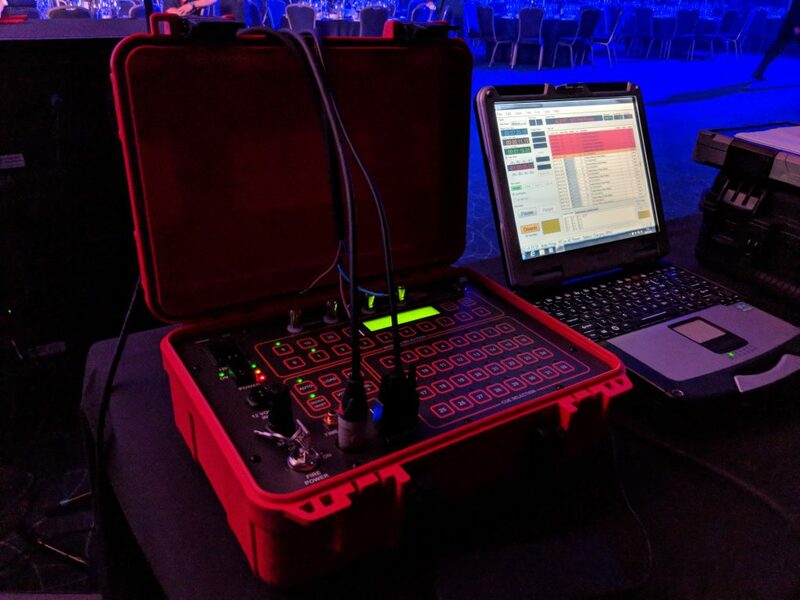 Our display director kept a close eye on the firing system stage-side, as we awaited the SMPTE timecode signal that would start the master shot clock running. The blue timecode indicator illuminated on the master FireOne™ XLII+ firing control panel – all was well! 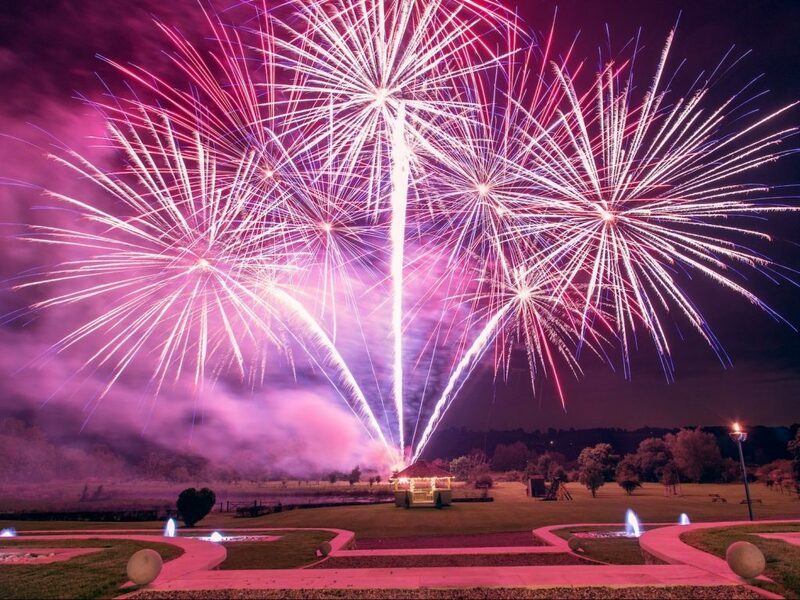 With the rehearsal over, and all preparations complete, our team were ready for the event to begin. Thousands of guests started to arrive and take their seats. 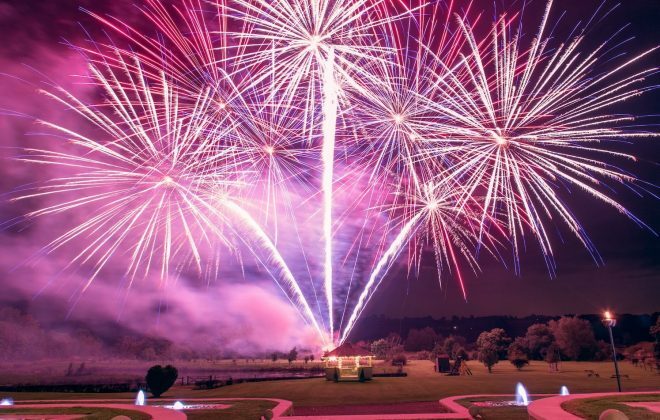 The hours passed by and finally, the wait was over – our team were in position and our display director armed the firing system. Right on cue, we received the SMPTE timecode signal, and the opening AV sequence began. The master shot clock counted down the last few minutes and seconds before the first pyrotechnic effects were cued to fire. 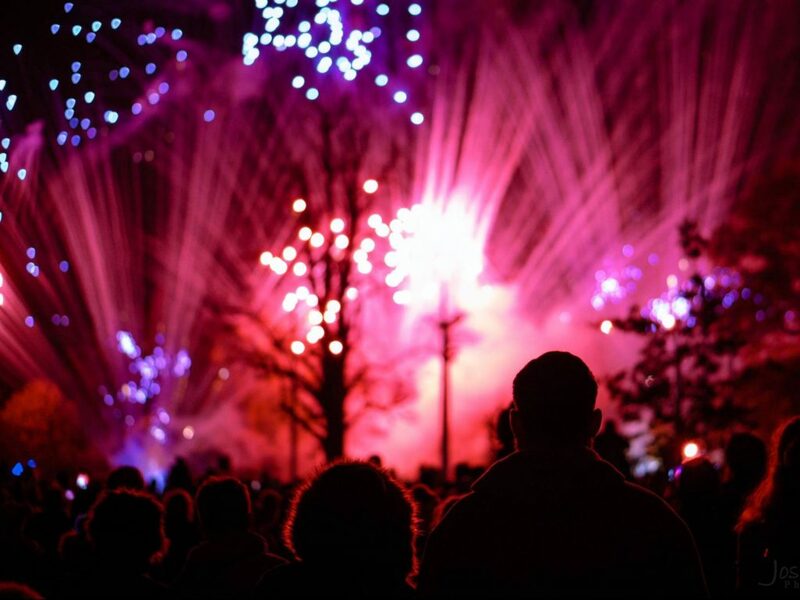 Our display director and observers kept a close watch over the stage, with line of sight visuals to each of the pyro props at all times. 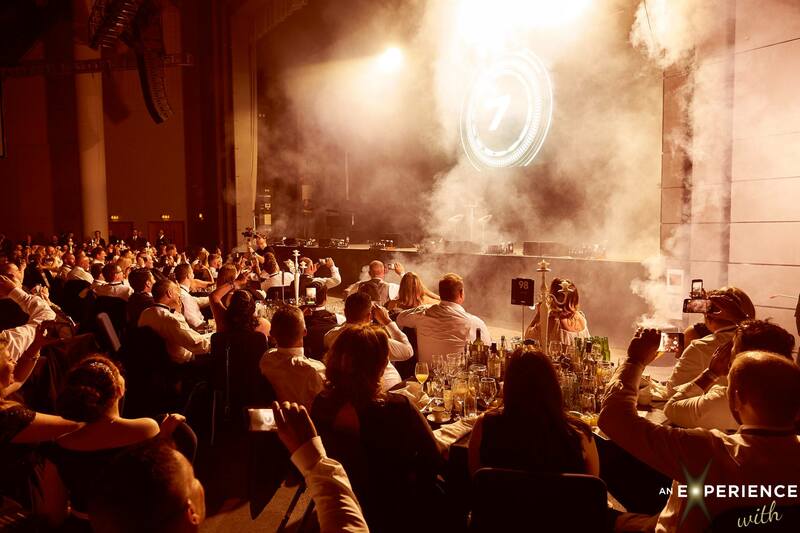 As the master shot clock reached zero, the first effects began to fire exactly as designed, and the audience erupted into roars of loud cheers – the atmosphere in the room was electric, the energy levels and excitement were absolutely incredible. Sequences of stage mines, flame projectors, silver jets, flash units, and theatrical maroons fired from seven positions along the stage. 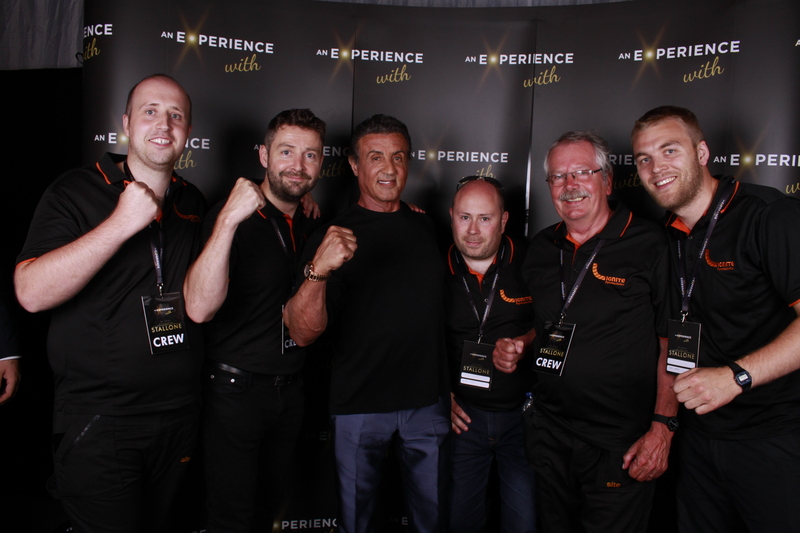 As the final effects finished, the State 51 swing orchestra started playing an incredible version of Bill Conti’s Gonna Fly Now, and we disarmed the firing system and made the stage safe – ready for the arrival of the close protection team and the VIP – Sylvester Stallone himself. 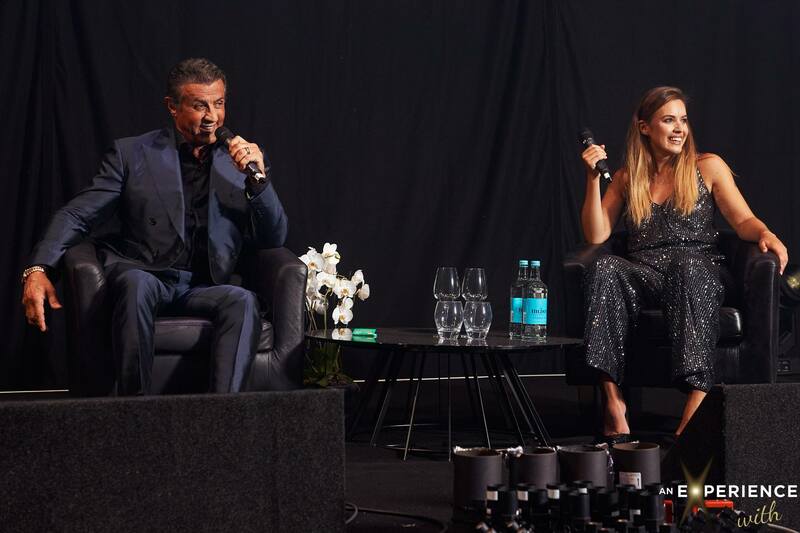 On a high, our team watched on as the evening’s main event began – an on-stage interview with Sylvester Stallone, hosted by television presenter Charlie Webster. Once the event drew to a close, we de-rigged and packed away all of our equipment, and then we headed straight up the M6 to Birmingham for the second night, and a few hour’s precious sleep at the hotel! 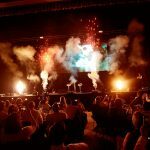 Our team arrived at the ICC straight after breakfast, ready to reload all of the pyrotechnic special effects and rig the stage props for the second show later that evening. Hundreds of individual effects were mounted, pre-wired, and electrically tested on site, prior to final positioning on the stage. Meanwhile, in Hall 3, our display directors met with with senior management at the ICC to perform the final series of test firings. 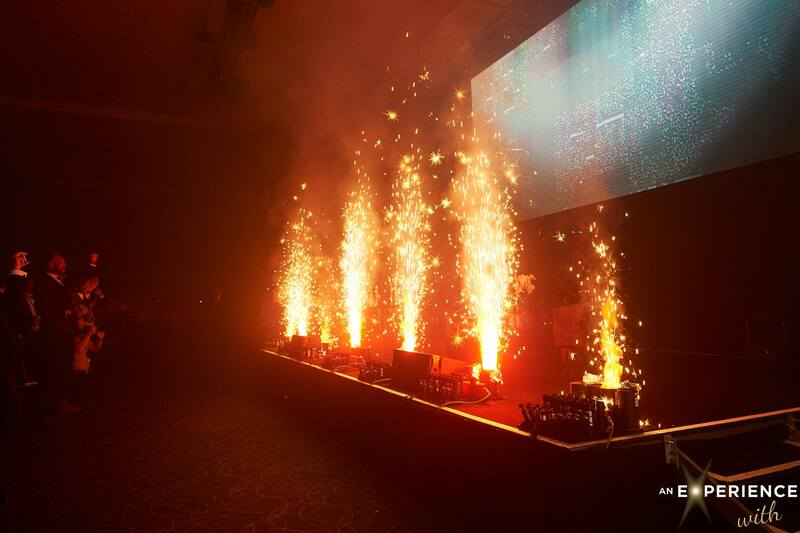 With everything signed off, our team placed all of the rigged pyro props on the stage, and then with the area clear of personnel, we performed a full comms & continuity test using the FireOne™ UltraFire field software. Everything was ready to go! The second night was a wonderful success. 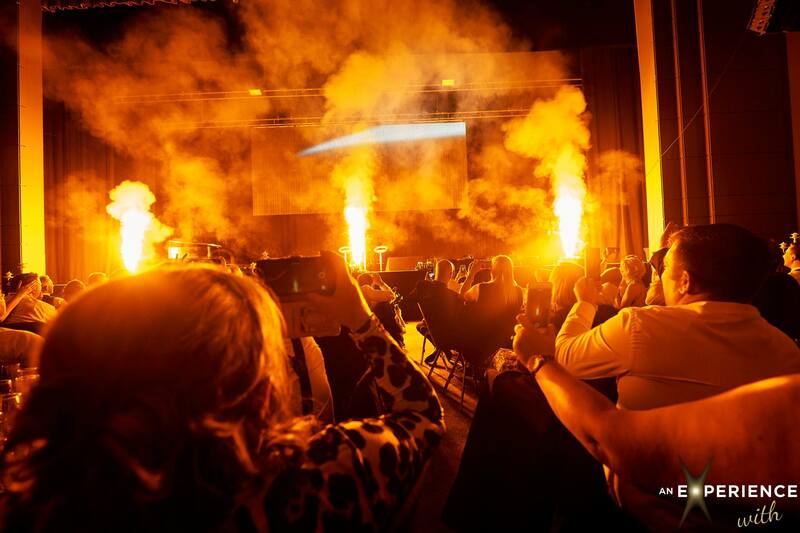 The large working height and width of Hall 3 at the ICC meant we were able to use larger pyrotechnic effects, including stunning sequences of ‘VS’ virtually smokeless mines and short duration silver jets. 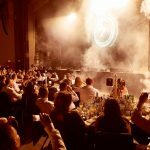 Our client, An Experience With, were over the moon, and we look forward to working with them again soon on more world-class events around the UK in 2019.